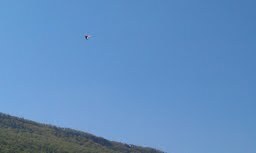 Home > Blog > Pam's husband Hang Gliding! I'm sure we all have different things on our bucket list to do before we leave this earth. Some are fun...some are exciting...some are just truly on a wish list to do.... and some are downright dangerous! Our CSR Pam's husband Michael decided to mark off one thing on his bucket list. Finding himself in the best shape of his life, Michael decided to learn to hang glide. Both him and Pam headed to Georgia to Lookout Mountain last summer. After taking a week of lessons Mike was ready to launch off of the mountain. He loved this so much that they went again at the end of the summer and he even purchased his own personal hang glider! They just returned for a third time from Lookout Mountain. I am attaching a photo of Mike in the air - yes, that "speck" is him! What an awesome trip! Pam is Mike's personal ground crew - she picks him up at the bottom of the mountain, helps him break down the hang glider then takes him back up the mountain and helps set him up again. Yes - I am certain Mike appreciates her as much as we do! !